With the widest range of concrete garages and accessories we guarantee that you won't be disappointed. The Lidget Compton Apex stands above its rivals by a superior roofing system, extra walk through height and a diverse range of accessories. Supplied with a prestigious 12.5° degree concrete fibre corrugated roof, factory pre-treated timber fascia, barge boards and window plus a steel retractable up & over garage door. 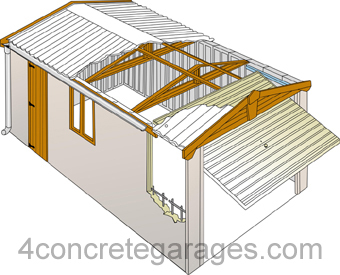 This model can be specified with extra-high 7ft6in concrete garage panels with a proportionately high garage door. Sizes range from 8ft6in - 26ft6in double garages and length can continue practically indefinitely providing two or three car lengths if desired. The standard finish is spar/pebbledash and the most popular options include the addition of brick front posts, PVC fascias and access doors. Our steel pedestrian doors now include extra-point locking as standard and this extra security maybe carried to the main garage door as well as an electric operator or a change in garage door design. Our Deluxe, Premium Options Maintenance Free packages provide excellent value for money in a pre-packaged garage bundle or you may individualise your building from a range of possible garage accessories. Roof panels supported on prime steel box section trusses for extra strength and rigidity. Timber roof runners 70 x 70mm, planed and treated closer pitched. White Hörmann horizontal-rib, steel framed, powder coated, fully retractable up&over door.